The Financial Services Royal Commission (FSRC) has exposed appalling behaviour from once respected leaders. And while we're right to be outraged, it's important to understand that it's not entirely their fault. Pinning all the blame for poor behaviour on deliberate individual choice is a fundamental attribution error. This occurs when we overestimate the importance of others' attitudes and underestimate the effect of context on behaviour. Media narrative that focuses on personalities rather than the effect of context on behaviour is symptomatic. We need to rise above the salacious gossip and the spectacle of corporate beheadings to understand what drives behaviour in powerful people, take a more reasoned approach and achieve sustainable change. Getting to the top of one of the organisations currently exposed by the FSRC is quite an achievement. Those at the top are on average brighter, better qualified, more capable and much harder working than the rest of us. But eventually that leads to their undoing, according to Dacher Keltner, a professor of psychology at the University of California, Berkeley. Keltner argues that as power corrupts, leaders exhibit four telltale behaviours. They display empathy deficits, self-serving impulsivity, incivility and disrespect, and are susceptible to narratives of exceptionalism. For example, in one study, when asked to draw the letter E on their foreheads for someone sitting across from them to see, people feeling powerful were nearly three times more likely to fail at taking another’s perspective. In other words, those feeling powerful wrote the letter E from their own perspective so that it appeared backward to others. 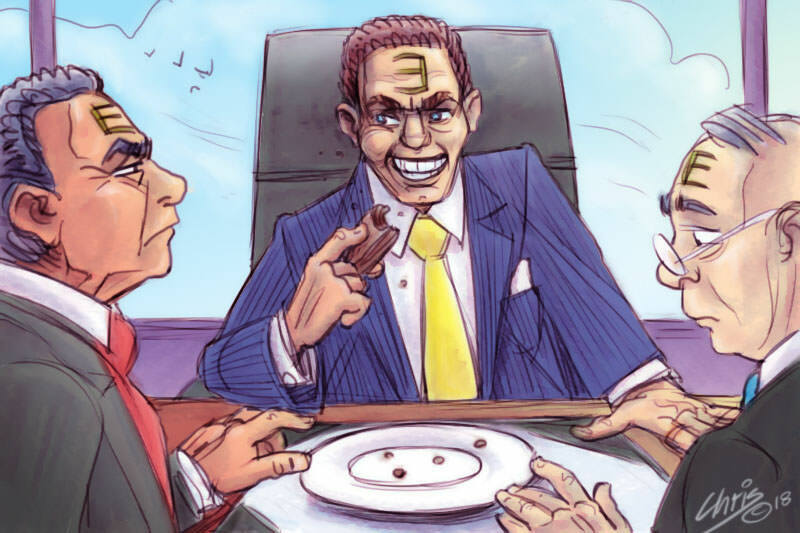 In another study, those feeling powerful were nearly twice as likely to display self-serving impulsivity, in this case by taking the remaining extra chocolate biscuit ahead of their less powerful colleagues. And in another, nearly half the drivers of expensive cars ignored pedestrians at a crosswalk, whereas none of those in cheaper cars did. One only need listen to a random selection of interviews from the FSRC to find echoes of some or all of these behaviours. And those bad behaviours form a cocktail with the kinds of biases that we all suffer from, particularly optimism bias, overconfidence, and the illusion of control. To explain these terms briefly; optimism bias, as the name suggests, is the tendency to assume that things will work out in one's favour despite indications to the contrary. Confirmation bias is the tendency to select information that supports a belief, ignoring or discarding evidence that contradicts that belief. And the illusion of control reinforces the other two biases by leading us to think that we have greater control over outcomes than we do, when we are more likely to just have control over inputs and part of the process. Luck or favourable circumstances are discounted in the assessment of success, leading to an overblown sense of personal control. "Keltner went as far as to liken having significant power to a form of brain damage." It's hardly surprising then that people in power act apparently 'irrationally'. To a large degree they are unaware of their bad behaviour as it can be automatic and unnoticed. In fact, Keltner went as far as to liken having significant power to a form of brain damage. So, if people at the top are to some extent their own worst enemies, how can we stop this happening again? Based on this understanding here are some suggestions for what can be done. The sackings, resignations and takeovers are not good enough, as sackings for instance will likely just suppress the problem in the short-term, not fix it. From a behavioural perspective, what's likely to happen is that we see a fresh crop of leaders rise to a position of power, who will no doubt be more socially aware, more capable and hard working than the rest of us, just like their predecessors. And that's the problem. The fresh crop of leaders, even those anointed by identity politics, are just as likely to be subject to the same biases as those that brought down their predecessors. And de-biasing training has a very patchy track-record. So, what's the alternative? The key is to remember that context influences behaviour. Change the context and you change behaviours. In short, limit their power. Don't give too much power to the few for too long. Practical examples of this are: robust and more engaged non-executive boards that seriously challenge management proposals; more diverse boards (and not just token identity politics) that think differently from their management teams; greater emphasis on long-term outcomes for executive remuneration; and a critical review of the nature of relationships between the top end of town and their corporate advisers. If we can rise above reveling in revenge and take a measured approached based on understanding of behaviour, then we might achieve sustainable behaviour change. Conor Wynn is a part-time researcher interested in behaviour change and decision-making. His PhD at BehaviourWorks is multi-disciplinary, combining social psychology, sociology and philosophy, and focuses on how power influences behaviour and decision-making in organisations. Hi Conor, Great article, although I find it difficult in the extreme to accept that executives aren't to blame FULLY. Fiduciary obligations, legal obligations, and basic human decency, were trampled in the chase for higher profit. Time to pay the piper with the BankingRC! At the risk of sounding sexist, there was a TV series a few decades ago now about "Men Behaving Badly". The two protagonists were generally presented as funny, misguided men. Of course, bad behaviour is not confined to men. We give power to certain people in our lives whether they actually do exercise power over us or not. Anyone in a leadership position though needs to be aware that their behaviour can be construed negatively and their responsibility lies in not letting baser instincts take control. So much damage is done when explanations are offered to justify bad behaviour. We are all capable of attempting to justify wrong-doing. It catches up with us. How to fix a damaged relationship? Truth-telling from more than one perspective may help. I think what Conor is saying is, what is the purpose of cutting the head off the monster if we have built the ideal society in which to breed and nurture future monsters. We should understand that future monsters will be more aware of what happened to their predecessors and be more careful, not necessarily more moral. Thanks Connor! Power does corrupt! For example, powerful people in the Australian Government want people earning $40,000 a year to pay the same rate of tax as those earning $200,000. As if the walth divide in this country isn't far too great already! And the same powerful people are doing little to combat climate change, which will adversely affect the natural environment, and also particularly the world's poorest people. Choose carefully when you vote at the next Federal election! Usually the hard working, more intelligent and more qualified people are the ones we seek out as providers of best advice. You are suggesting that we should indeed recycle these people for others that are less qualified, hardworking and intelligent ? Catherine Brenner, the recently resigned chair of the AMP is example at point. She held a low level director position at ABN Amro which was by any measure a second tier investment bank. The AMP employed her. A roles she would never have been awarded as a male because of the obvious lack of qualification. Significantly, a few highly skilled people resigned from the AMP board because of her appointment. Hence forth, she was unable to maintain the governance required within a very complex industry and may now face criminal proceedings .. Conor, I think you significantly underestimate the complexity of these roles. Provide support to the best people it don’t sacrifice their own achievements and dumb down the entire process. Interesting article Conor. I suspect that a similar dynamic is operating in some areas of the Catholic Church where 'pray, pay and obey' is still the fall back position of many of the faithful. I'd be interested to see Wynn apply his proposals to the operation of the Catholic Church Hierarchy in relation to the Laity. Perhaps our evolution as a species has played a role, in that we have had to learn to follow the leader implicitly and without question, such as in times of war, and that the leader has to act decisively, regardless of the consequences. Of course, such a hierarchy tends to encourage the thinking that it was one's brilliance and effort that got one there, and to ignore the very significant role that luck played. So, "empathy deficits, [...] impulsivity, incivility and disrespect" are traits that often develop as a result, but grow as they are useful to the leader in those certain circumstances. The hierarchy is useful then, and a major obstacle in other circumstances, where social skills are needed, as in education, health, care for the poor and so on. The other side of this is the tendency of people to become captured by the hierarchy, rather than holding out, especially if the hierarchy selects and grooms them, separating them from the plebs they once were. It is called culture behaviour - one can blame individuals but all Boards are made up of other individuals - so it is a collective culture behaviour - and in positions of power - it is about the bottom line PROFIT - not about the consumer - governments and politicians are no different - they act the same - collective behaviour in decision making - media editors are the same - the pick and choice what stories they run with - they ignore the pleas to expose patriarchal attitudes and behaviour - as they too are people in power - so do we blame the editor for not publishing a story????????? This has been a discussion point today for my work world. Amazing how we easily see these attributes in others but fail to take a hard look at ourselves. We all do well to ask how this affects us and ours? "Don't give too much power to the few for too long". For a very long time, the Jesuits have been expert at implementing this principle to keep their members' feet on the ground by limiting the term of office! The Society of the Divine Saviour (Salvatorians) who base much of their structure on the Jesuits also limit the term of office of their hierarchy. Perhaps the answer to their unfettered power is to limit the term of office of the Catholic Church hierarchy. "Rooster one day, feather duster the next" is probably a very good prescription for engendering humility, something the hierarchy often seems to lack. Sure Connor we ought not blame the individual for the sins of the system. We ought interrogate the system. Looking at individual personality will note explain systemic behaviour; though it is a contributor and often easier to research. And I am familiar with the studies at Stanford and Toronto into the clerical behaviours of rich individuals. As some of your respondents have said putting a new plant into toxic soil will only grow another toxic plant. And as they say culture eats strategy for breakfast. Wilf Bion on behaviours in groups nails it every time. You are talking about dependent institutions where to stick out is fatal;all decisions need to go through the head. And as some of your respondents suggest the connection with the Catholic church is apposite. Systems thinking beats individual psych every time when dealing with organizations. Having said that I have little time for the Nuremberg response claimants who blame authorities for their lapses and the timorous who say, "If I call that out I will lose my job".